Introducing, Ingine, Inc. it is a startup in its incipient stages of developing BioIngine platform, which brings advancement in data science around Interoperability. Particularly with healthcare data mining and analytics dealing with medical knowledge extraction. Below are some of the lessons learned discussed while dealing with the healthcare transformation concerns, especially with the ONC’s Interoperability vision. Healthcare administration has often been viewed as one of the most conservative of institutions. This is not simply a matter of the inertia of any complex bureaucratic system. A serious body with an impressive history and profound responsibilities cannot risk unexpected disruptions to public service by changing with every fashionable new convenience, just for the sake of modernity. A strong motivation is needed to change a system on which lives depend and which, for all its faults, is still for the most part an improvement on anything that went before. However, this is also to be balanced against the obligation of healthcare, as an application of science and evolving human wisdom, to make appropriate use of the new findings and technologies available. This is doubly indicated when significant inefficiencies and accidents look as if they can be greatly relieved by upgrading the system. Sooner or later something has to give, and the pressure of many such accumulating factors can sometimes force a relatively entrenched system to change in a sudden way, just as geological pressures can precipitate an earthquake. An Executive Forum on Personalized Medicine organized by the American College of Surgeons in New York City in October 2002 similarly warned of the increasingly overwhelming accumulation of arguments demanding reform of the current healthcare system…if there is to be pain in making changes to an established system, then it makes sense to operate quickly, to incorporate all that needs to be incorporated and not spin out too much the phases of the transitions, and lay a basis for ultimately assimilating less painfully all that scientific vision can now foresee. But scientific vision is of course not known for its lack of imagination and courage, and is typically very far from conservative, still making an element of future shock inevitable in the healthcare industry. A) Generally approaching to characterize a system, there are two views, complicated and complex. Complicated is with problems of system operations and population management, while complex problems are about multi-variability with an individual patient diagnosis. Generally, all management concerns around operations, payment models, healthcare ecosystem interactions, etc deal with delivering the systemic efficiencies. These are basically complicated problems residing in the system, which when resolved yield the hidden efficiencies. All those that affect the delivery of the clinical efficacy have to deal with complex problem. Mostly owing to the high dimensionality (multi-variability) of the longitudinal patient data. When both, complicated and complex concerns are addressed the Healthcare as an overarching complex system will begin to yield the desired performance driven outcomes. 1) Foundational; 2) Structural; and 3) Semantic. 1 – “Foundational” interoperability allows data exchange from one information technology system to be received by another and does not require the ability for the receiving information technology system to interpret the data. 2 – “Structural” interoperability is an intermediate level that defines the structure or format of data exchange (i.e., the message format standards) where there is uniform movement of healthcare data from one system to another such that the clinical or operational purpose and meaning of the data is preserved and unaltered. Structural interoperability defines the syntax of the data exchange. It ensures that data exchanges between information technology systems can be interpreted at the data field level. 3 – “Semantic” interoperability provides interoperability at the highest level, which is the ability of two or more systems or elements to exchange information and to use the information that has been exchanged. Semantic interoperability takes advantage of both the structuring of the data exchange and the codification of the data including vocabulary so that the receiving information technology systems can interpret the data. This level of interoperability supports the electronic exchange of patient summary information among caregivers and other authorized parties via potentially disparate electronic health record (EHR) systems and other systems to improve quality, safety, efficiency, and efficacy of healthcare delivery. The above levels of interoperability only deal with achieving semantic compatibility between systems in the data transacted from the large number of myriad systems (EHRs) while they converge into a heterogeneous architecture (HIE / IoT). This only deals with the complicated concerns within the system. They do not necessarily deal with the extraction and discernment of the knowledge hidden in the complex health ecosystem system. To achieve this for some simplicity sake, let us define need for a second order semantic interoperability that concerns with the data mining approaches required in the representation of the systemic medical knowledge. It is this medical knowledge; implicit, explicit and tacit that all together form evidence based medicine much desired to facilitate any clinical decision support system. It must be noted that in the MU2 criteria, it is suggested that besides achieving health information exchange pivotal to the creation of Accountable Care Organization (ACO), at the least five-health priority or critical health risk conditions must be addressed employing clinical decision support system. Deservedly created, this point creates a need for addressing clinical efficacy, in addition to achieving best possible system efficiencies leading to systemic performance driven outcomes. This means a much deeper perspective is required to be included in the Interoperability efforts to better drive data science around data mining that can help better engage physicians in the realization of the performance driven outcomes. Rather than allowing physicians to be encumbered by the reimbursement model driven EHRs. Also, although most EHR vendors employ C-CDA to frame the longitudinal patient view, they do not necessarily send all the data to the Health Information Exchange, this results into truncating the full view of the longitudinal patient records to the physicians. When dealing with the primary care, it is desired that today’s physicians who are over-burdened, moving forward works as a team lead engaging variety of healthcare professionals, while also better enabling trained nurse practitioners. Furthermore, also rendering the work in a lesser-cost environment while moving away from higher cost environments such as hospitals and emergency care facilities. This also means moving away from service-based models into performance based payment models becomes imperative. It must be noted that dealing with the way an organization generally works reassigning responsibilities both horizontally and vertically, has to do only with the complicated concerns of the system, not the complex problem. Again it must be emphasized that data mining related to evidence based medicine, which is in a way knowledge culled from the experiences of the cohorts within the health ecosystem, will play a vital role in improving the much desired clinical efficacy leading ultimately to better health outcomes. This begins to address the complex systemic problems, while also better engaging the physicians who find the mere data entry into the EHR cumbersome and intrusive; and not able to derive any clinical decision support from the integration of the System of systems (SoS). In the recent times Bayesian statistics has emerged as a gold standard to developing curated EBM (http://www.ncbi.nlm.nih.gov/pubmed/10383350) and; in this context we would like to draw attention that while correlation is important as discussed in the above linked article, which is developed from the consensus of the cohorts in the medical community, it is also important to ascertain the causation. This demands need for a holistic Bayesian statistics as proposed in the new algorithms, including those built on proven ideas in physics advancing the scope of the Bayesian Statistics as developed by Dr. Barry Robson. The approach and its impact on the Healthcare Interoperability and analytics are discussed in the link provided below. Another interesting aspect that emerges is the need for biostatistics and such many doctors with MD qualification are getting additionally qualified in Public Health Management, which also deals with Biostatistics. Dealing with population health one hand and clinical efficacy on the other, Interoperability via biostatistics has to deliver both views macro wrt systemic outcomes and at the micro level clinical efficacies. Developing such capabilities means much grander vision for Interoperability, as discussed in the OSEHRA, VA sponsored Open Source Efforts in making VistA available to the world market at a fraction cost. More discussion on the OSEHRA forum in the below link. Interesting point to note in the discussions on the above link, is that a case is being made for the role of data science (previously called Knowledge Engineering during last three decades) driving better new algorithms, including those built on proven ideas in physics in the Healthcare Interoperability. This helps in advancing the next generations of the EHR capabilities, eventually emerging as a medical science driven cognitive computing platform. 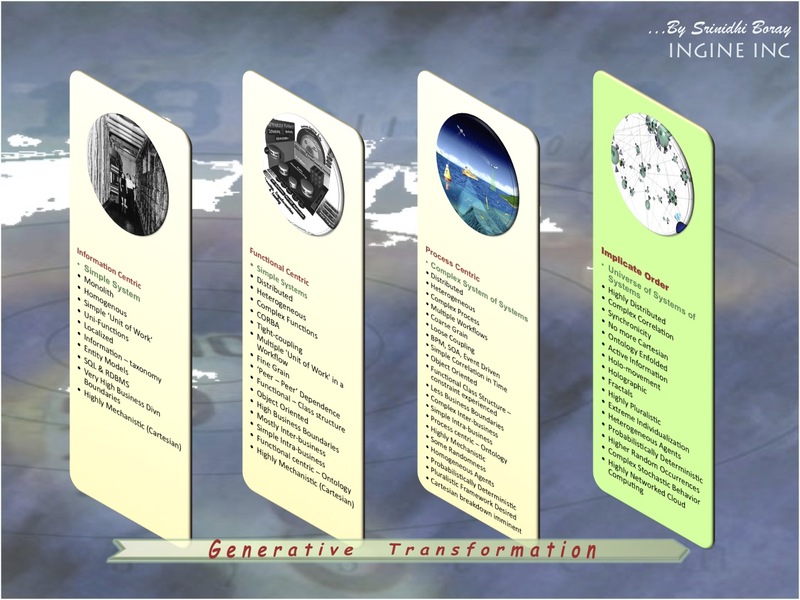 The recommendation is in the employ of advances in the data science in moving the needle from developing a deterministic or a predicated System of systems (SoS) based on schemas such as FHIM (http://www.fhims.org), that proves design laborious and is outmoded, to harnessing the data locked in the heterogeneous system by the employ of advanced Bayesian statistics, new algorithms, including those built on proven ideas in physics and especially exploitation of the algebra. 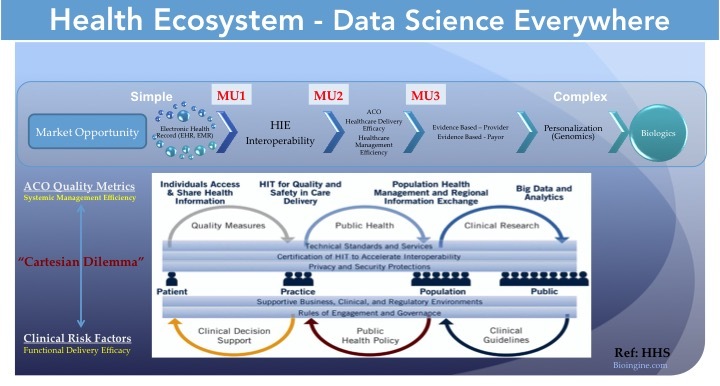 This approach delivered on a BigData architecture as a Cognitive Computing Platform with schema-less approaches has a huge benefit in terms of cost, business capability and time to market, delivering medical reasoning from the healthcare ecosystem as realized by the interoperability architectures.